Based on the Cypress Windowblind by Mikeb314. This one is a new layout for me. 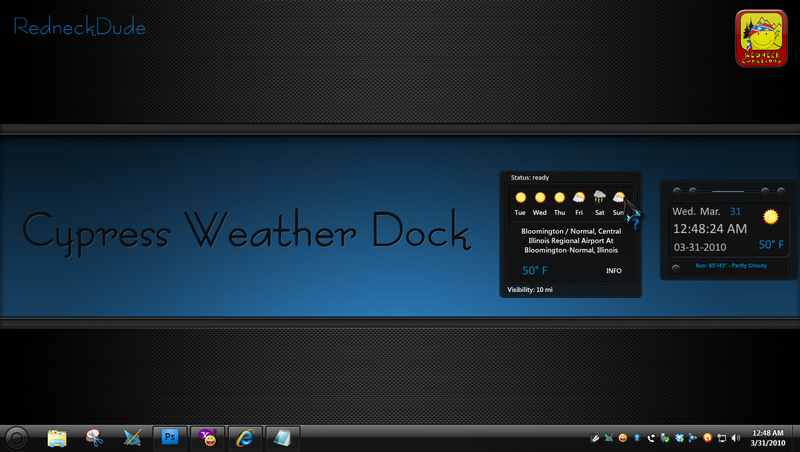 The current weather sits on a dock anywhere background, along with several other handy buttons and a clock that also shows the date! It has a screensaver starter, link to more skins, recent places, and a link to your printers folder. (If docked at bottom, the taskbar must be elsewhere, or the margins changed in the script). See my matching DesktopX theme too! Thanks to sViz for scripting and to Wizard1956. Thanks to Murex for graphics help. Really enjoy your gadgets/widgets. I seem to have trouble with this one not showing the clock or the date...any ideas? The weather itself works fine.